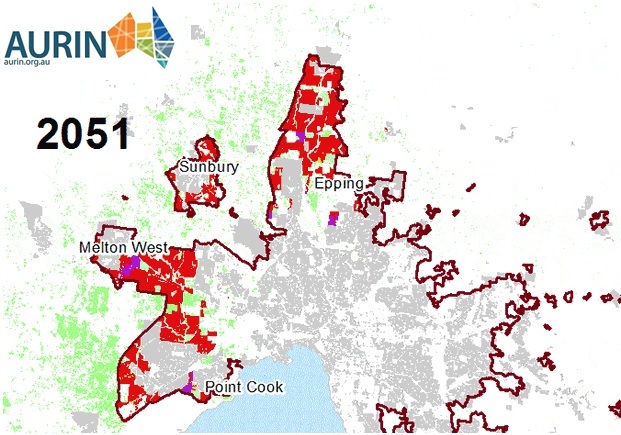 AURIN contributed data and mapping to this article in The Age by Royce Millar and Ben Schneiders. The article explores Melbourne unprecedented growth and the impact on our livability. Dr Georgia Garrard and her team from the Centre for Urban Research at RMIT University (CUR) worked with AURIN to access demographic data and produce the urban growth projections depicted here. CUR is directly responding to the globally important need to shape cities that are environmentally, socially and economically sustainable. AURIN provides access to quality spatial data and analytics to support Australian researchers. Growth in the fringes, data powered by AURIN.